Cup on the Bus: Some controls are in order. Perhaps a double blind? Some controls are in order. Perhaps a double blind? Science Fair, as it has been co-opted by the STEM faction, has come and gone again this year, mostly. My memory of last year is the judges went to lunch and forgot to dismiss Emily’s group until some old grandma went into the hall and asked when these children would be allowed to eat. I have an additional memory of last year’s STEM fair. Emily emerged from her first of many meetings saying she was partnering with a student who was a sophomore, and their project was whatever it was. Then the older girl dumped her, on the advice of her mother, for the possibility that Emily might turn out to be unreliable. 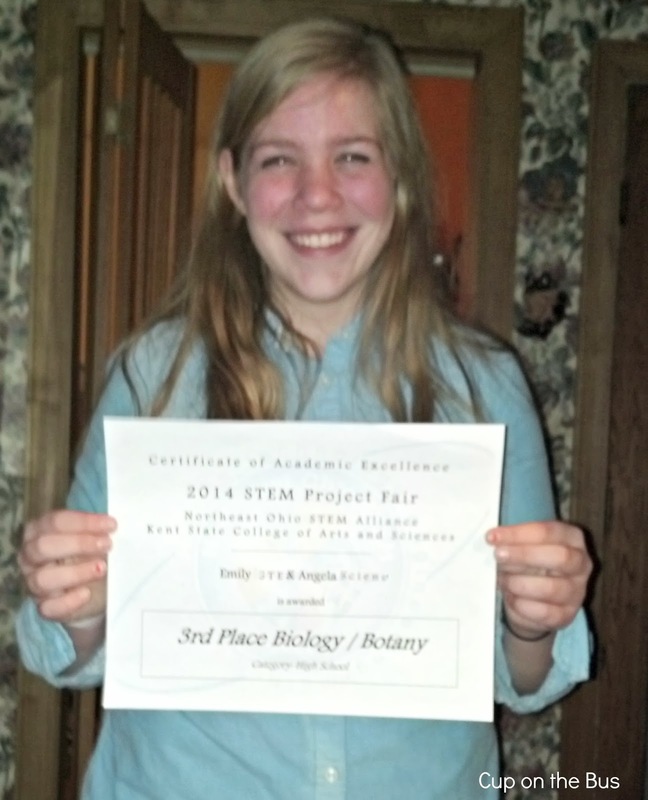 Emily got through a project, and boy, did we both learn STEM is about far more than tri-fold boards. Emily and Hamilton both had STEM fair requirements this year, so off we went to the first meeting. I had just read an article about the uptake of arsenic in rice, especially in the more “naturally” produced rices and very especially in baby cereals marketed as “natural.” Sadly I had not read enough scientific articles to toss an idea to Hamilton on the ride to school, but he did OK on his own. The chemistry teacher provided test strips, Angela bought a bag of brown rice and a box of Minute Rice, Emily rode Angela’s bus to Angela’s house many Friday nights, and Grandma took Hamilton along to find Angela’s house in the dark, before Grandma got new eyes. The intrepid young ladies experimented away in Angela’s basement, and wrote a paper, with surprisingly few grammatical errors, considering neither would consider a career in the English language. From time to time I asked how the great rice project progressed; the general response was I did not want to know. The mistakes were legion; there was no time to start over. They still called it the great arsenic in rice project, while privately conceding they had no controls in place, not even knowledge of the origin or processing of their rice samples. So, they forged on. Science Fair was the first of February. Once again Emily was not dismissed on time; she and Angela were held over for the award ceremony and promotion to the next competition level, in March. A very interesting project...and they got put forward....great job. Good for them, for the project and advancing. Food, rather the poisoning of our food, is one of my hot button issues. We are what we eat. When we eat poisons, we get sick. Just look at the rise of all those autoimmune diseases correlating with the rise of poisons and chemicals in our food. And don't get me started on GMOs. Good for her! How compassionate that she chose a freshman to be her partner. She will be a wonderful mom one day! Well done. You must be proud. I don't know them, and I'm proud of them. Well it certainly does sound like these grand kids are so busy in school working on interesting projects. I'm glad that Emily had a simpatico partner this year. in previous centuries, arsenic was used as a beauty treatment, it was taken in minute proportions in food to smooth the skin. Taken over too many years or in too large proportions it did damage the health however. Since I continue to eat rice, I worry myself. So that is so interesting about your well water having even more arsenic than rice because I tell myself that by rinsing the rice a few times I am removing the arsenic from the rice but actually, I may be adding arsenic if my water is from a well. Or not. City water probably has too much arsenic also. Sorry got off the subject of what great girls these are and what a fantastic job they did. At least they're probably going to continue to think about what they eat and drink in the future. Now THAT is a happy face! Congratulations to them for advancing! WTG to Emily and Angela! Sounds like an interesting project to take on too! Two talented girls with lots of motivation...What does STEM stand for? Wow. Congratulations Emily and Angela. And River is right. Arsenic was used to smooth the skin and make hair and eyes shiny. And, over time people built up a tolerance and could consume quite large amounts of arsenic with no ill effects. Even to the point of killing someone over a shared meal. I alway knew there was a reason why I'm not that fond of rice. Makes me wonder if all those arsenic related deaths in Victorian times were just health kicks gone wrong! Good for Emily and Angela! And an interesting read, to boot. Very interesting. We are on well water too. When we next have it analyzed, I should check the arsenic level. So I think I shall have potatoes. Congratulations Emily and Angela, well done. Sounds like they've learned a lot about science and research. One of the first lessons is in study design, and this is the way to learn it. Good for her. Black beans and white rice are the main staples here in Costa Rica..... we pass rice fields on our way to Liberia. Isn't arsenic one of those poisons that after you ingest it so long you become dependent on it? Anyway, wonder what the impact of the rice diet is here? All that wondering aside... Congratulations girls on an interesting project! She's cute. That's the best I can do comment-wise today. Need a nap. I think your two stars did exceptionally well. Emily is a sweet natured young lady taking Angela under her wing - a lesson in character building, as well as a science exercise. That other young madam who dumped Emily in the first place could well learn something equally valuable from her. My question is: How does the arsenic get into the rice? I mean, who's putting it in there? And how did it get into your well-water? This entire post is causing me some paranoia. Where do you buy those test strips? Arsenic is a fairly common element. Just google it and you'll have an arsenic PhD in no time.